Summer a-coming! 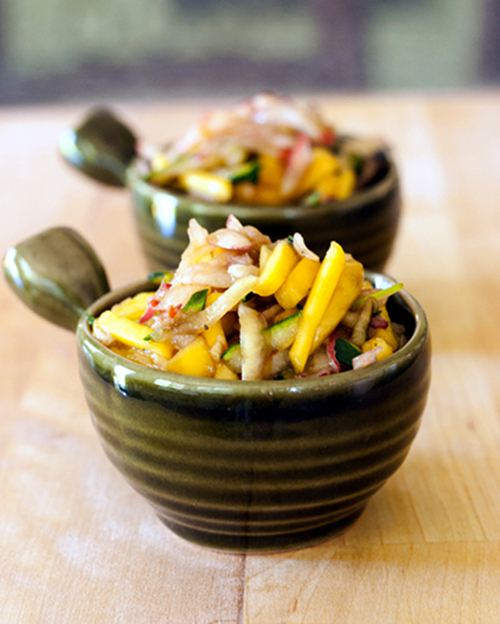 Fruit slaw is a delightful companion for your summer barbeque without adding too much calories to your meal. The fruits in this recipe can be substituted with any kind of firm fruits. In a large bowl, whisk together the first 5 ingredients; add fruits and toss gently to coat. Season with salt to taste. Serve immediately. may I ask where you got those beautiful mini bowls?? They're just stunning. LOL, I got them from Daiso Japan (http://www.daisojapan.com) store in Union City, CA for $1.50 each. yum I have never seen fruit slaw like this before! Nice recipe but I didn't realize we're neighbors. I live in Fremont! Wow, we really indeed are neighbors. We should meet up sometimes.